It was a Sunday. December. and nights over watery Paradise. Wet dreams, our only hope. 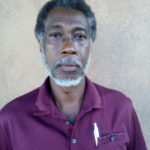 Reuel Ben Lewi is a Guyanese poet/ dramatist and a former teacher at the Buxton Community High School, Georgetown, Guyana. He read Sociology at the University of Guyana and has published in Poui, Guyana Christmas Annual, Timbucktu, Sx Salon, Xavier Review, The Dalhousie Review, Moko Magazine, Caribbean Reads.Anthology: Where I see the sun: contemporary poetry in Anguilla (House Of Nehesi Publishers, 2015).